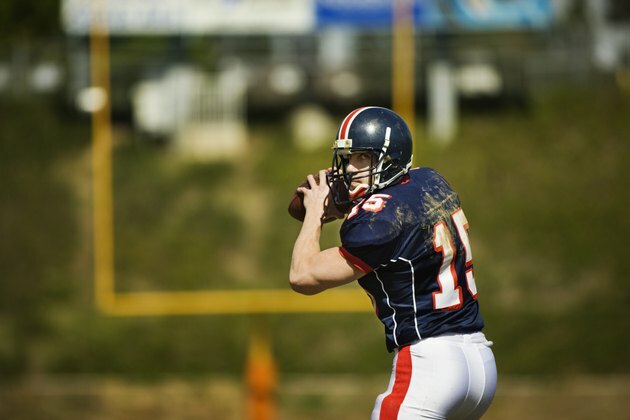 Elbow pain when throwing a football is often simply diagnosed as elbow tendinitis. However, there are different types of elbow tendinitis. Pain that occurs when throwing a football is called "thrower's elbow." Whereas most forms of tendinitis only affect one side of the elbow, thrower's elbow -- common in football players -- affects both sides of the elbow. Thrower's elbow affects both the medial and the lateral sides of the elbow. Pain on the medial, or inside of the elbow is commonly called golfer's elbow while pain on the lateral, or outside of the elbow is commonly called tennis elbow. Elbow tendinitis that affects football throwers inflames the tendon's connections between the pronator teres muscle, the extensor carpi radialis brevis muscle and their corresponding bone joints: the medial epicondyle and the lateral epicondyle. The most basic and frequent cause of thrower's elbow tendinitis is overuse. When you throw a football, your arm is moving at a rapid rate that puts stress on your elbow. As your arm comes around your body, the inside, or medial, tendons stretch to maximum capacity. At the same time, the outside, or lateral tendons are compressed. Tendons are responsible for holding muscles to bones at certain distances. Tendons have some elasticity, but stretching them greatly can have adverse affects. Likewise, compressing them puts unnecessary pressure on the bones. Over time, this stretching and comression wears down the tendon's connections. The problem is made worse when players throw without warming up because the tendons are stiff and inflexible. Symptoms include pain, swelling and stiffness when throwing the football. Thrower's elbow in football players is treated either with or without surgery. Surgery repairs more severe cases of tendinitis; most cases will require non-operative procedures. These treatments are meant to reduce inflammation, regain strength and increase flexibility. Treatments can include wrist and elbow stretching exercises, massage therapy, application of heat and ice and light strengthening exercises. Treatment also includes avoiding any activities that exacerbate the pain or inflammation. The best way to avoid elbow tendinitis is with proper warm-up and stretching routines prior to throwing footballs at full speed. Gradually warming up the tendons with gentle throwing sessions loosens them and allows them to stretch naturally, reducing strain when throwing at full speed. After warming up the elbow, engage in a series of thorough stretches of the elbow, wrist and shoulder. When player's are not throwing, steps should be taken to keep elbow's warm with a jacket or blanket. Coaches and parents should instill these practices into young players when they start playing football to develop good habits.